Cleaning Chemicals - Use, Storage and Hazards - MacFawn Enterprises, Inc. When it comes to cleaning supplies, storage is KEY! It doesn’t matter if you make your own, buy all lemon scented, or go all green with your cleaning solutions – Storage is Key. Improper storage could cause serious problems. The first thing to remember is to always store cleaning products where they will be used. Keep your kitchen cleaning products in the kitchen. Keep you bathroom cleaning products in the bathroom. Keep the home products in storage closet. This will help keep like solutions together. 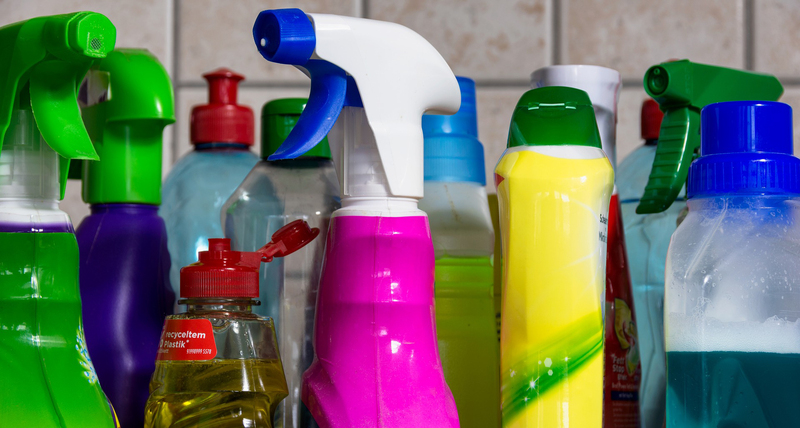 Many household cleaning products are either bleach based or ammonia based. Each have their own set of cleaning benefits but need to be respected. These products can assist you in cleaning in major ways however as said previously, THEY NEED TO BE RESPECTED. If a bottle leaks or spills and the bleach base product combines with an ammonia base product, the chemical reaction that happens forms a very dangerous gas. Inhaling the vapors could cause adverse health outcomes such as respiratory damage or throat burns. In severe cases, exposure can even lead to death. The EASIEST thing to remember: Keep each room’s cleaning solutions in the room they belong in. This will keep the like chemicals together.